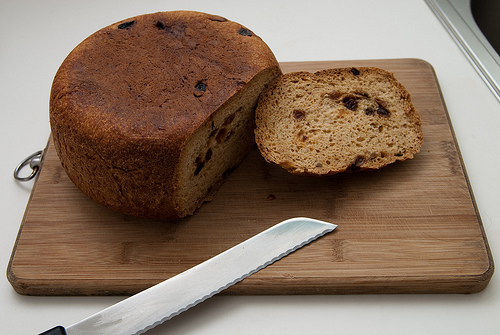 Cake from a Roaster, Bread from a Rice Cooker—Where Will the Madness End? So you need to make a cake or bake some bread, but you don’t have a full-size oven. How about using a roaster or a rice cooker instead? It can be done. And while they may not be your top choices, in some countries, these small appliances may be your best options. We used a roaster similar to this one while we were in Taipei. In Taiwan, most meals are built around things cooked on top of a burner, rather than in the belly of an oven: There aren’t too many nationals cooking a pot roast or broiling steaks. The Taiwanese aren’t big on sweets, like us Americans, so there’s not a lot of cookie and pie baking either. With great bakeries scattered throughout most cities, there’s little need to whip up a cake on your own. And besides all that, the typical Taiwanese kitchen is pretty small, without room for any “extra” appliances. Before we moved to Taiwan, we considered our options: Bringing over a Western-style range-oven combo and finding a place for it on a balcony of an apartment that we hadn’t found yet would have been troublesome. Besides that, the oven we had at the time wasn’t worth shipping over. Buying a used oven from another expat family who was leaving would have been unpredictable. And buying a new oven there would have been expensive. In the end, we decided on the roaster-oven option. You’ll probably have to leave your food in the roaster longer than the recipe calls for. And lifting the lid to check on your progress releases a lot of heat and adds more time. A small metal rack, or something else that lifts up the baking/cooking pan, will keep foods from burning on the bottom. If you don’t have a rack, you can use an upside-down cake pan. If you can find a rack with legs, you can cook on two levels, with a pan above and one below. It can be difficult to get large pans into and out of the roaster. There’s not a lot of wiggle room, so be extra careful not to burn your hands. After our roaster gave out, some generous friends bought us a countertop convection oven. We brought it back from the States with our checked baggage, and it worked great for the rest of our time in Taipei. It wasn’t long before we saw a similar oven for sale in a shop near our neighborhood, so if we were to go back to Asia again, we’d probably plan on locating one there. But what if a roaster oven is out of the question? What if your kitchen countertop space is all full? Or what if you don’t even have a kitchen? Don’t despair. A rice cooker can save the day. And if you’re in Asia, you certainly won’t have any trouble finding one to buy. If you’d like to find recipes and how-to’s for baking with a rice cooker, just do a search on the Internet. You’ll see that it’s not a problem, as the even the simplest model can bake cakes, cheesecakes, and breads. Most recipes will work in a rice cooker without being modified, but you may need to cut back on the size. Cakes won’t cook evenly if they are too deep, and breads will work best if they’re no more than a few inches thick. Bread will need to be flipped over several times during the baking process so that it won’t burn underneath. If it takes more than one cooking cycle to complete a recipe, then let the cooker cool down and start it again. Another option is to wedge something under the switch to prevent it from flipping to “warm.” Be careful with this second method. You’re bypassing the cooker’s automatic shutoff, so it can get too hot if left unattended, and it might shorten the life of your cooker. Of course, one way to make things easier is to buy a modern rice cooker with a “bake” or “cake” setting. (I didn’t know those existed until I started writing this.) But if you’re old school in your rice-cooker preferences, you’ll go with a more traditional style. Have nothing to do with anything “Micom Programmable.” Nothing to do with words like “Neuro Fuzzy.” No dials or “settings.” Nothing fancy. You will only cost yourself money and mess things up. If a rice cooker comes with more than two pages of instructions, you’ve overspent. I am saving us money. What you want is your basic Pot with two speeds: Cook and Warm. Maybe it will say it in Japanese. You’ll figure it out. Though Ebert doesn’t stray into the realm of baking, he does enthusiastically praise the rice cooker for its abilities in preparing such things as vegetables, stews, soups, sauces, and oatmeal. 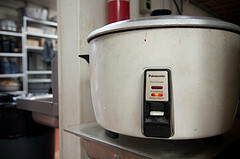 I was about to finish up this post when I had a thought: I wonder if you can bake with a crockpot (slow cooker). Sure enough, you can do that, too. I don’t have any experience with this—cooking or eating—but I can point you to a couple sites that give some details. The first one is from Better Homes and Gardens, entitled “Easy Slow Cooker Dessert Recipes.” There you’ll find directions on making cheesecake, pudding cake, brownies, and cobbler, along with the kind of almost-too-good-to-be-true photos you see in magazines like . . . well . . . Better Homes and Gardens. The second is from Carroll Pellegrinelli at About.com—”Crockpot Baking: Making Breads and Desserts in the Slowcooker.” If you don’t have a slow cooker with a baking insert (again, who knew there was such a thing? ), you can use a coffee can, paper towels, and aluminum foil. It’s not fast—it is a slow cooker—but, according to Pellegrinelli, it’s easy. So . . . what else can you use a roaster oven, rice cooker, and crockpot for? Or what else can you use to bake a cake? Well, that’s up to you. Thanks to Bev for her input. She’s been a great help to expats in Taiwan for many years, showing them how to adjust their Western recipes to Eastern kitchens and cupboards. She even helped helped put together a cookbook in 1981, “Tips ‘n’ Treats” on Taiwan. If I’d looked in my wife’s copy before I wrote this post, I would have seen several recipes for baking with a rice cooker. I should have consulted her as an expert. 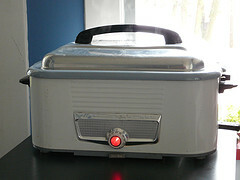 § 5 Responses to Cake from a Roaster, Bread from a Rice Cooker—Where Will the Madness End? Seems like in a lot of kitchens outside the US don’t come standard with ovens—especially in apartments. Just one more example where not everyone thinks (or cooks) the way we do. Thanks, Bev. I thought of you when I was writing this. As you can see above, I’ve added a postscript on my post to include your input. Wow, thanks for the tips! I’m exchanging cooking lessons with many of my neighbors and they all want to learn how to make chocolate cake and banana bread. I was stumped as to how to bake without an oven. We’re in India so we do have access to a convection oven. I’m also going to try a paniyaram pan with one of my neighbors – its a stovetop pan for making South Indian dumplings, I figure it will cook cake batter pretty well, too. You are currently reading Cake from a Roaster, Bread from a Rice Cooker—Where Will the Madness End? at Clearing Customs.